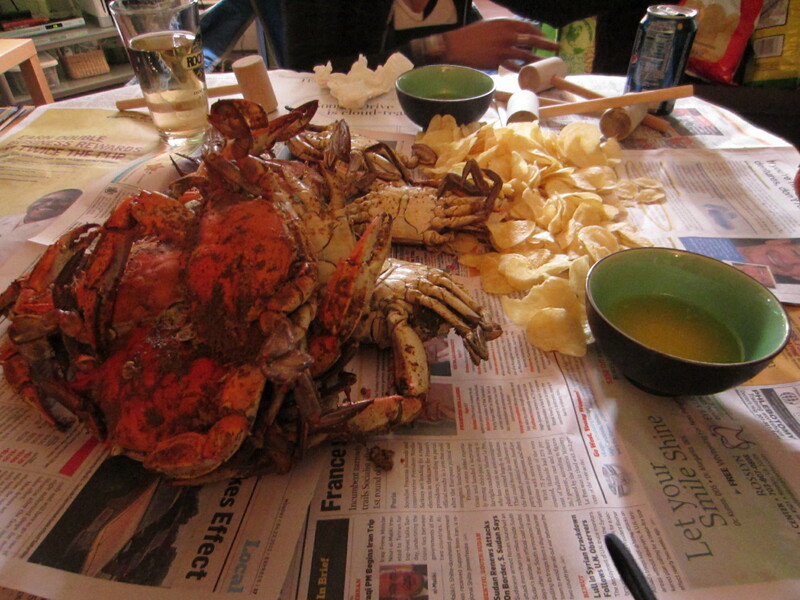 Seasonal Eating: Maryland Blue Crabs! When the weather gets warmer here in DC, a few magical things emerge: tourists in matching red, white, and blue outfits, rooftop bars, public pools, and Maryland Blue Crabs (not an exhaustive list). Before moving to DC, my only experience with crab involved King crab legs and lots of complicated cracking tools. 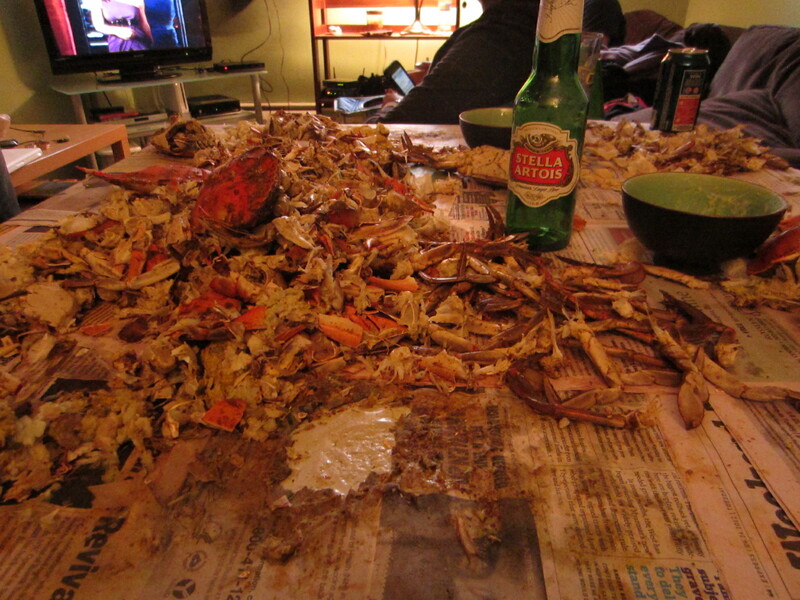 While my first time with the official state crustacean of Maryland was only about a year ago, my favorite part has become the social aspect of sitting around a pile of crabs with a group of friends, taking hours to pick out the sweet meat. A few weeks ago, a friend picked up a fresh bushel of Maryland Blue Crabs from local crab joint, Ruff N Ready Crabs in nearby Hyattsville, MD. We gathered around a table with chips and beer, and got ready to dig in. 2. Set aside plenty of time. Eating crabs is not a quick meal. Gather a group of good friends, put on some music or a movie for some background noise, and get crackin’. 3. Don’t eat the yellow stuff in the middle of the female crabs. Some people refer to it as “crab mustard” and think of it as the best part (not me), but it contains some toxins that you might want to avoid. 4. Save the legs for last. These are the easiest parts, and I find it a little more fun this way. 5. Make sure to have some other food to eat if you’re hungry. While delicious, the amount of meat in a Maryland Blue Crab isn’t really enough for a meal. Bake some potatoes, grill some corn, or make a few other side dishes to fully be satisfied. Also, I’ve found that if I eat nothing else besides crabs, I walk away from the table with quite a stomach ache. While it’s fun to take a bunch of already steamed and seasoned crabs home and have your own little party like we did, there are many other options for enjoying Maryland Blue Crabs this spring and summer. Cook them yourself! Steam or boil them with some old bay and you’re ready to go! You can find them in many places around DC, including the Southwest Waterfront and many other restaurants in the city (check out Anthony Bourdain enjoying crabs at the Wharf). This entry was posted in Taste, Washington, D.C. and tagged crabs, DC, food, how to, melissa, seasonal eating, spring, summer, taste.